This is a very enjoyable coming of age story about two boys (one trans) who find that they are drawn to each other when they meet at Scouts. As we spend the last few months before college with them, we get a good understanding of their thoughts and hopes for the future. We get to meet both their families and understand some of the dynamics which form the background to their developing relationship. Kyle and Travis are also key to getting Wren and Felipe to admit to each other how they feel – and they definitely add the comedy, as well as Kyle being a mentor to Wren. A lovely mix of a simple young romance, the complexity of not following the standard paths, and a good appreciation of the way it affects family and friends. This is a really sweet and innocent feeling young adult romance. It is the story of the unlikely relationship between a gay trans Navajo kid and a closeted Mexican Catholic boy. Both Wren and Felipe are social misfits who find a scout group where they can belong. I have to admit that I liked the idea of this story more than I liked the actual book. I feel like too many ideas and moments are mentioned but not fully developed. I wanted to know more about Wren’s Navajo culture. I wanted to know more about his sibling relationships. We get some insights into Wren’s experience as a trans teen but I’m not sure we ever properly get into Wren’s head or his heart. Very few of the characters in this book feel real to me. Wren’s parents say and do the right things. They are nice and good – but they aren’t interesting, and Wren’s family never moves past 80s sitcom family clichés. The teenage characters are alternately far more mature and more kind than real life teens and also more innocent than any high school seniors could possibly be. Probably because I can still remember dating 18 year old boys, I didn’t ever buy into the nervous hand holding and stolen kisses between Wren and Felipe. This is a sanitised, low-heat romance without much sexual tension between the characters. The result is a sweet and gentle coming of age story. The boys are adorable but not very believable. This is the book I’d lend my mum if she wanted to try a LGBT romance. 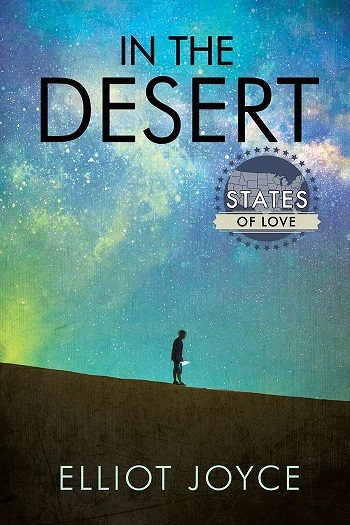 Reviewers on the Wicked Reads Review Team were provided a free copy of In the Desert by Elliot Joyce to read and review.